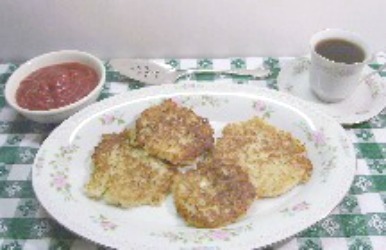 Potato Pancakes Recipe also known as Latkes are made with grated white potatoes, onions and flour. This recipe contains no eggs. They are fried in hot vegetable oil until crispy and golden brown and served plain, with ketchup or a dollop of sour cream. Many of us old-timers remember eating these Pancakes at one or more meals, frequently. They were served for breakfast, dinner (what we called our mid-day meal), or supper, our evening meal. In those days, potatoes were cheap and plentiful. Home gardens contained several rows of this vegetable growing throughout the summer, ready for a bountiful Fall harvest. Some recipes list eggs and baking soda or baking powder as an ingredient. We prefer keeping it quick and easy! The following recipe is Mama's version. She liked it because it was simple to prepare and so delicious! Mix potatoes and onions in a medium-sized mixing bowl. Sprinkle flour and salt over potatoes and mix all ingredients well. Heat oil in a skillet on medium/high heat until hot enough for frying. Place 1/2 cup of potatoes for each pancake into hot oil. Flatten cakes slightly with the back of a spoon. Cook 2 to 3 minutes on each side until lightly brown. Remove to serving dish with a spatula. In addition to serving with the condiments listed above, sliced tomatoes and an egg omelet team well with this dish especially for brunch. Applesauce or stewed apples are also excellent served with this dish for breakfast. *You may substitute any type vegetable oil. However, peanut oil gives this dish a delicious, nutty flavor.